Problem: Your elementary school-aged child is hooked on comic books instead of on her math book. Solution: Give her the Beast Academy books by Art of Problem Solving. New Problem: Your elementary school-aged child is staying up past her bedtime to sneak more math problems. Solution: …we’ll have to get back to you on that. The Art of Problem Solving provides math enrichment activities and instruction for high-performing middle and high school students. It publishes its own line of math textbooks and also has a website where students can interact with a large community of other math lovers, play math games, view video lessons, and more. With its new Beast Academy books, Art of Problem Solving has expanded its offerings to younger students. The books, designed for kids in 2nd-5th grades, are divided into four levels, from 3A (shapes, skip counting, perimeter, and area) to 3D (fractions, estimation, and area). There are both guide books and practice books available for each level. The books cover the concepts mandated by the common core curriculum. But that won’t matter to your child. What will matter is that he won’t be able to get enough of them. In the guide books, concepts are introduced and explained by a group of colorful beasts whose color, size, amount of hair, and number of appendages varies. They are friendly and appealing, and they narrate lessons that are presented in comic-style frames. The graphic format allows plenty of opportunities for characters to point to different parts of, say, a number line or a fraction, as they explain the concepts. And because the lessons are presented as dialogue, students are privy to the beasts’ thinking processes as they reason through problems and concepts. The practice books provide problems so students can put their new know-how to work. Beasts from the guide book appear in the practice books, too, offering tips and instructions at the top of each page, which makes the pages feel familiar and accessible and less like a typical homework assignment. As in the guide book, instructions and examples are very visual. If your child is bored with standard math instruction, struggling in math, captivated by comics, or particularly receptive to visual material, these books are certainly worth investigating. They would serve as great end-of-summer reads, too; children may enjoy reading the appropriate Beast Academy book before the school year begins to introduce them to important concepts they’ll cover in the next grade. 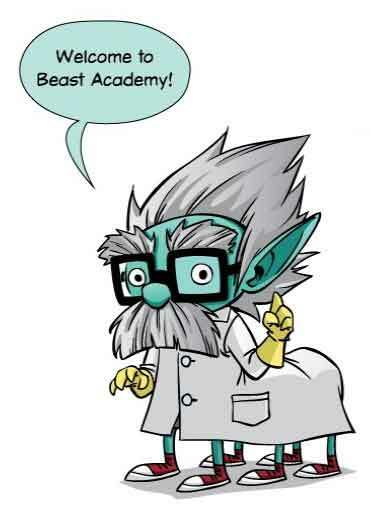 Parents can visit the Beast Academy website to see sample pages from both guide and practice books, as well as learn more about the series and access free, printable pages.